Next week I am going to the Colorado School of Mines to attend the First International Workshop on Rock Physics, 1IWRP. The name certainly is a bit curious: surely there must have been conferences in rock physics in the past, right? Yes, but the title points to the notion that this conference is the first time a meeting of petroleum rock physicists has happened independently of a technical society such as the EAGE or SEG. I don't see this as a specialist community revolting against these organizations, but it reflects an increase in attention and enthusiasm for the application of rock physics in the industry. Interestingly, this conference sprang directly from a discussion group on LinkedIn. I will be presenting a poster entitled, Create a software culture beyond the experts, as part of the sesssion devoted to Transferring rock physics knowledge and technology to asset teams. It's a topic well-suited to this audience, because, even though rock physics is a key component in many areas of petroleum geoscience, it still remains partially obscure, or under-recognized as a take-it-or-leave-it niche. Mine will be a softer, community-building appeal for knowledge sharing beyond our distinguished specialists. Velocity Evolution during Controlled CaCO3 Precipitation and Dissolution, Ralf Weger, et al. If anything in the conference catches your eye, drop me a line in the comments and I will do my best to capture notes on it. I will be reporting highlights throughout the week on the blog, so please be sure to check back and follow along. 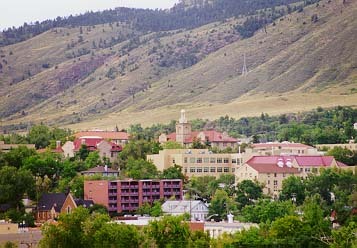 The photograph of the Colorado School of Mines campus is the work of Wikipedia user Cperko. The poster is now available in the downloads section or by clicking on the thumbnail above. You can also watch a 6 minute video on my presentation in the post called, 'Beyond the experts'.